As the nights draw in, it feels like the right time to be taking stock of the various successes and failures at Oca Acres. Let's start with a success story. This is me modelling a young mauka seedling a few months ago. For some unaccountable reason, I seem to have clean fingernails - apologies for the oversight. These same mauka seedlings have matured into vast, hydra-like monsters, bulldozing all in their path. Usually mashua (Tropaeolum tuberosum) can hardly be described as a good neighbour, what with its unabashed delight in strangling its bedfellows. This year, though, things are different and I feel an unfamiliar wave of sympathy for it; the poor thing has been utterly trounced by the march of the maukas. This was the state of play back in the early summer - that's the mashua at the bottom left. The vertical object at the back is a shovel, a long handled one; the plants are now about a metre or so high and considerably more than that in total length. They're refreshingly vigorous. Of the mashua, nothing can be seen. The weather for the last few months has been disappointing - nothing new there: lower than average temperatures and lower than average sunshine. Apparently it's been the coolest summer for eighteen years. The maukas, however, seem to have been wholly unconcerned by any aspect of these temperature and insolation anomalies. About the only things to check their growth were a few aphid infestations on a couple of shoots, but even those seem to have passed. Given reasonable levels of care at the beginning of the season, mauka does seem to be a toughie and, let's not forget, actually tastes rather good. It should also be remembered that it is a rare crop even in the Andes, where the total area under cultivation is reported to be around 10 hectares. Scary. To the best of my knowledge, this patch is probably the biggest one between here and Belgium, where Frank van Keirsbilck grows quite a bit of it. Frank has produced roots weighing more than 2kg from a single plant. Mine have never been quite so large, but my main interest is in trying to duplicate those descriptions of earthed-up stems thicker than a man's forearm, which feature in Lost Crops of the Incas. The best I've managed so far are these from a couple of years ago. There is still much to learn about this plant and how to cultivate it, but I do like its attitude. Rare it may be, but it's also raring to go. Up and at 'em, Mauka! I am impressed. That looks very good. If you get any spare seeds for next year, I am willing to try it up here(assuming I am still jobless) or elsewhere (assuming employment somewhere). 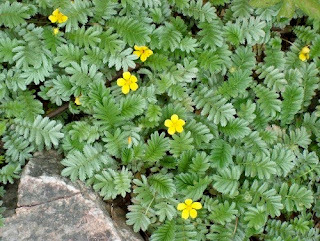 If you are interested I can send you seeds of Spignel(Meum athamanticum) which has a very spicy aroma, the dried roots of which as supposed to be the spice. It smells wonderfully savoury. Mauka's certainly a very unusual plant with untapped potential. Spignel sounds like fun. I'll DM you.